I hope everyone had a nice long weekend and had a fun Fourth of July holiday. We had a bit of a roller coaster ride with double loops and a few dips, but all in all it was a blessed few days. Thank you to everyone who sent well wishes to my mom. She had her surgery on Thursday and was home a few days later. I spent the weekend with her and she is doing remarkably well considering the five hour procedure. She reads my blog and actually read through the comments you ladies left on Wednesday. You all made her heart happy and she wanted me to tell everyone how much she appreciated the thoughts and prayers. Even though summer is in full swing and it's been warm enough to cannonball into the pool and lakes, we have also had mild temperatures compared to years past. The evenings have been nice enough to actually wear lightweight pants or even long denim. Last week I wore these Old Navy floral pants for a patio dinner on the lake. For a split second, I felt like I was living up north because not once did my pants stick to my legs. What a glorious feeling. If you are looking for a pair of light weight, summer pants, these might just be the ultimate winner. I plan on wearing them again when we travel next month, as a cover for my swimsuit bottoms and with a tank for weekend wear. Those pants are so cute on you! Glad to hear your mom's recovery is going well! Love the trousers, you look lovely! Our temps have been mild and beautiful too so far! These pants are absolutely gorgeous!! The print is great without being too bold, and I love the drawstring tie! These pants are so cute, love this whole look. I'm loving this outfit soo so much! I did a little squeal because I'm finally back in the states for a month and I'm going to run around and buy this whole look! Glad your mom is doing well! Sending prayers! Aren't these pants great? I paired mine with a chambray but I think Iove it more with an oxford!! I'll have to give it a try! Glad to hear that your mom is doing well :) Your pants are so fun! You look super cute and chic!! I want those pant for sure! Glad her surgery went well, and the recovery is going good. It's been unseasonably colder here too the last few days. Our 4th was spent wearing jackets, which is crazy since all the years before we were practically melting. I love all your great affordable finds, these pants are no exception!! Gad to hear your mom is doing well! 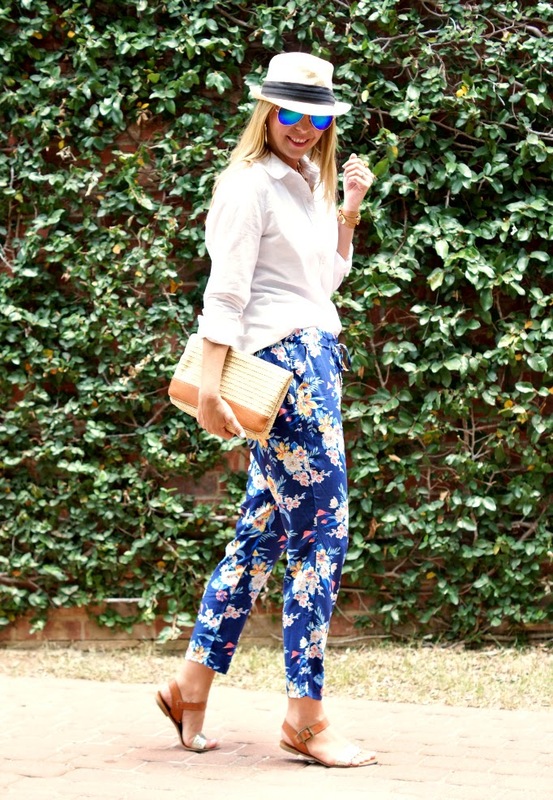 The floral print pant is so great! You rock them! Glad to hear your mom is doing well! The floral print is so pretty and the pants look really comfy too! This is so cute!! Those pants look so comfy, too! glad to hear your mom is doing well!! Yay! Glad your mom is doing well and that you had a great Fourth. Head to toe loveliness & Summer freshness.....get well soon wishes to your Mom!! Oh dear. Clicking on that link for those pants!!!!! 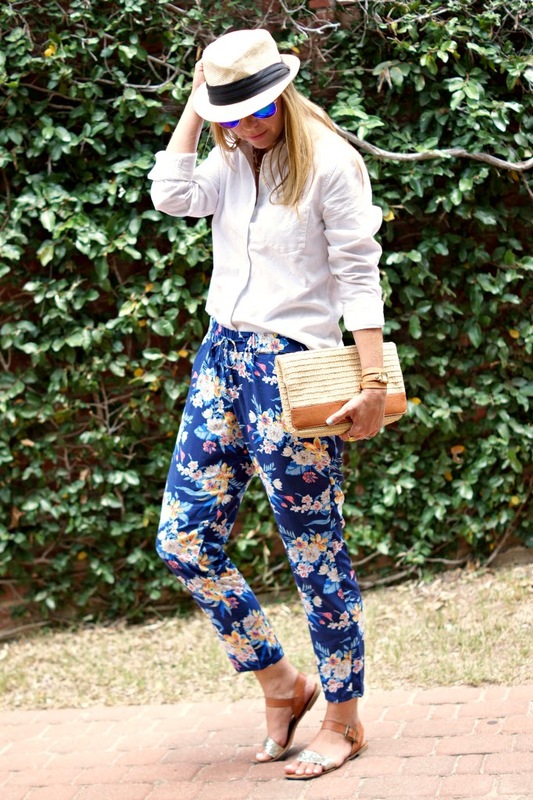 I'm dying for a pair of pants like these...the floral print on yours is so cute and summery! so glad to hear that your mom is doing better. Cute outfit! Hugs to your mom. You look so much like Katherine heigl in these pictures, but prettier. I'm glad your mom had a speedy and well recovery from her surgery. Bless you guys! I am loving the print of those pants! I'm glad to hear your mom is doing well! Sending prayers your way! It's so nice when the weather cools down just a tad to wear something you normally can't in the heat! Glad to hear your mom is recovering so well! Need those pants! They looks so comfy! I am so happy to hear that your mom is doing well! And I love those pants on you! Great glasses at a wonderful price point! Oh Miss Shanna, you are killing me with this look. Love those pants! I have those same shoes - they are so dang comfy and cute! And I love, love, love your pants - they look stylish, but also like they would do very well as lounge pants too ;) So happy everything went smoothly for your mom! You guys must be the only ones having mild temps! We most certainly aren't. Glad your mom is doing okay, and I can just imagine her reading the comments! I, too have been wearing my *jogger* pan ts. The light weight material is perfect for those summer nights! I love love love those pants. I almost went into Old Navy this weekend, but ran out of time. I know if I had gone I would have snatched those up! I love those pants!!! They're the kind that would brighten up any room! Mmmmk, when you're done with those pants, send them my way! Those are perfect teacher pants! They can hide random marks that your kids leave on you (hello marker stains!) and they are comfy enough to chase 20 10-year olds everywhere! Love! Wait, this shirt is from Old Navy? No way. Score! You are totally rockin' that "J.Crew" vibe this ON outfit provides! High Five! I bought the same hat yesterday! Those pants look so comfy AND cute! A perfect combo! Glad things are working out well with your mom! ;) Also, those pants look easy and light! Super cute look. I love the floral pants on you and you always wear such gorgeous accessories. I love that necklace! How fun are those pants? What a chic summer look! I'm literally about to run out the door to go pick up those pants from old navy! So cute! I'm glad your mom is doing well!